This was an official DPS trip, led by Kathy Rich, with co-leaders Larry and Barbee Tidball. Someone said the entire Inyo Mountains Traverse hadn't been done as an official DPS trip in over 20 years, so I hunted through the DPS archives. The only DPS report I found was from 1987, and while they did it in only two days they also finished around midnight. A non-DPS group also did a shorter traverse, driving around Pleasant Point. The official DPS website has an abbreviated version of this report. 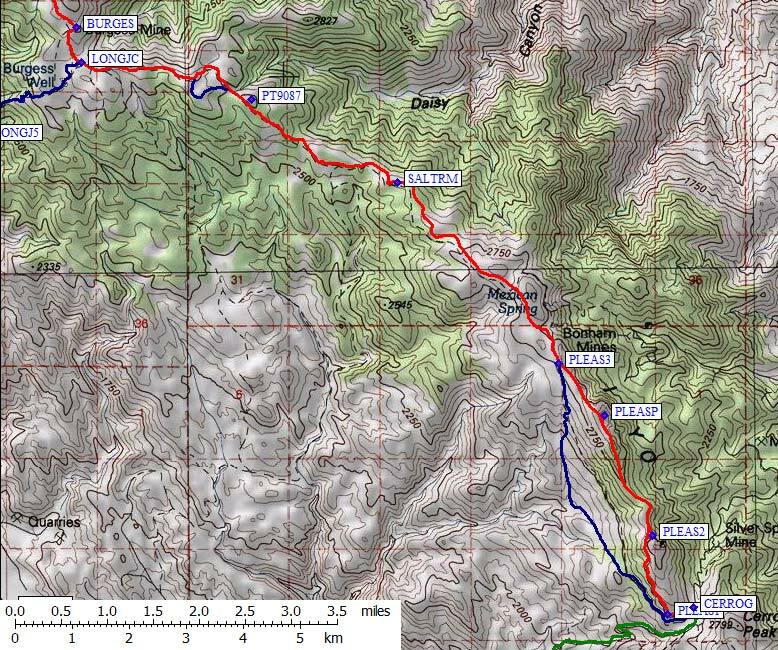 NOTE: GPS waypoints, road maps, and driving details are on the trailhead page. There is also an abbreviated text-only version of this report intended for publication in the DPS's Sage newsletter and web archives, which doesn't have the climbing maps and color pictures below (and it has less words, which might be an advantages if you think this is too wordy). The car shuttle dominated our first morning. 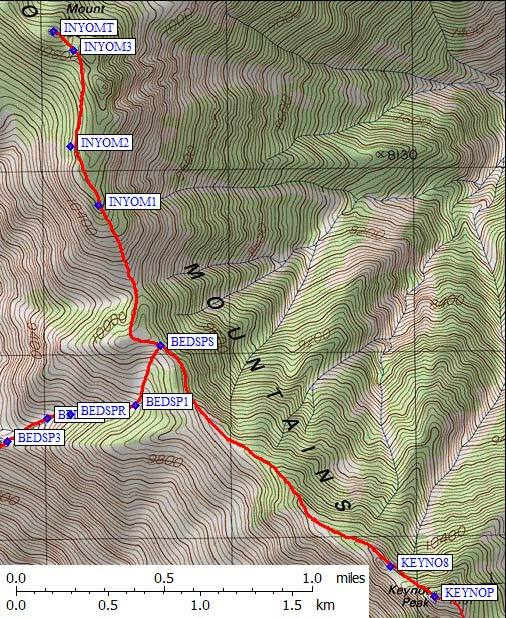 We met (630am) at the junction of Lone Pine Narrow Gauge Road and Owenyo Road (waypoint NGROWN). We shuffled plans and people and gear and sent some trucks to the exit trailhead (waypoint UNWA2W) while others waited at the meeting spot. Having the least capable vehicle there (a passenger car, for god's sake, what was I thinking? ), I left my car on the road to Union Wash. Everyone else's car ended up at one trailhead or the other. It took about 2 hours to arrange the shuttle, drop vehicles at the exit, and drive to our entry trailhead (waypoint CERROG) at Cerro Gordo (Fat Hill). NOTE: There's an error on the USGS maps! The saddle near the trailhead is marked 8794, but if you count contour lines it's only at 8200'. This means those who look at that number instead of the contour lines will incorrectly estimate the gain from here! From the Cerro Gordo trailhead (waypoint CERROG), we started around 9am and hiked uphill past the big steel gate. This good dirt road goes around the ridgeline to the west (waypoint PLEAS1), then turns north through Harts Camp and around the radio towers. We left the road where it crosses the ridgeline (waypoint PLEAS2), later noticing a use trail that sidehills around this final road climb. We dropped north to the saddle and followed the ridgeline, picking up a use trail that stayed on the west side of Pleasant Point. Bypassing several false summits, we left the use trail at 9600', scrambling 100' to the summit. Some of us left our packs on the use trail, others carried them over the top. One significant aspect of this trip was that we had to carry all our water for 3 days, so while that extra 100' of gain wasn't much, most of us were eager to drop the packs. We arrived on Pleasant Point (9690', waypoint PLEASP, not labelled on the map) around noon. We had made barely over 1 mph and climbed 1600', while our schedule called for a 13 mile day with over 4000' of gain. We enjoyed a nice lunch break and moved on, reaching the saddle north of the peak around 1pm. The use trail vanished, and we drifted down to the 4WD road (waypoint PLEAS3). If you're driving around, you can start climbing Pleasant Point anywhere near PLEAS3. The terrain is open, the footing is all the same, and the use trail north of the peak really doesn't matter. Owens Lake from Pleasant Point. Relaxing at the Salt Tram, our most comfortable rest stop. The next landmark on our traverse was the Salt Tram (waypoint SALTRM). 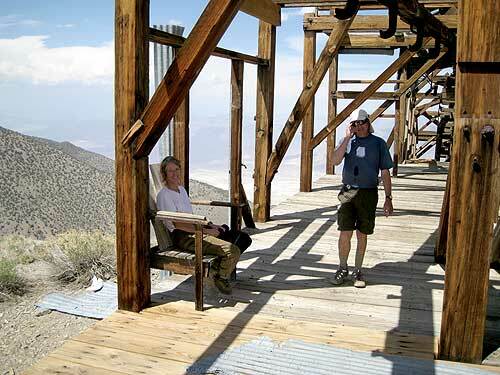 It was a huge cable car system designed to carry salt from the east over the Inyo Mtns to Owens Lake. It started 1000' lower than it ended, and is quite an engineering marvel. Some of the towers (all wood) have been dismantled and/or burned, but Friends of the Inyos are apparently rebuilding some of the towers. There's a restored house near the tram! Not just a hut, it has working doors, glass windows, and several rooms. We used the remaining structure as a wind break (since it was very windy by now) and took another long break lounging on the platform and snapping pictures of the huge beams and cables. We didn't leave until after 3pm. The Salt Tram is at about 8700', and just north of that you hit the low point of the trip at 8500'. There are well used dirt tracks coming here from somewhere else, and we saw a group of ATVs and another Suzuki 4WD club doing one-way driving loops. 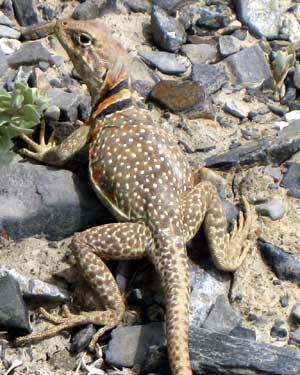 Not much of a wilderness experience, but they were friendly and the dust quickly settled. Then it's all pain and gain up to Burgess Mine and New York Butte. We had now been walking about 6 hours and had done 2400' of gain and 6.7 miles. Still right at 1 mph. I had to wonder out loud if we'd really camp on top of New York Butte as planned... but the storm clouds were mostly over the Sierra Nevada and we were cruising along in nice weather, so why worry? Blisters had been happening since early in the day for some, but by now the big problem was pack weight. We were carrying 3 days of water, 12 liters each, and the mileage was starting to matter. The road cuts southwest of Point 9087, then splits and re-joins before turning west. Wayne pointed out the top of the Long John Canyon route (waypoint LONGJC) about where we turned north for the climb up to Burgess Mine. We were now 11 miles and 8.5 hours into our day (530pm). Our speed had picked up a bit but our energy was waning. We staggered the remaining third of a mile and camped at Burgess Mine (waypoint BURGES), a nice saddle with an old shack and lots of room on old mine tailings to spread out. Fortunately the stiff breeze died out around dark and the threatening clouds dumped no rain. 11.3 miles and 3300' of gain made for a long enough first day. The remaining 1.7 miles / 1000' to New York Butte was far easier in the morning! For me, the best part was recovering a gallon of water that Daryn Dodge had kindly cached for me when he drove here a few weeks earlier. I know, it was cheating not to carry it the whole way. We left camp just after 6am, and walked the road all the way to its obvious end, which turned out to be too far. Before the nice campsite at the end of the road, there's a small parking area with wooden parking stops (waypoint NYB4WD). For a description of driving the 4WD road, see this 2009 report. Driving or walking, this is where you should leave the road, going west instead of north! If you go all the way to the saddle on the main ridge, you'll thrash around in bad brush (like we did) instead of walking an abandoned road (like the line on my map shows). The climb to New York Butte from the end of the road is actually easy if you find the use trail that follows the remnants of the road on the map. Some of us got on the trail around waypoint NYBUT1, while others cut a higher line in the chaparral. I think Larry was the only one to stay on the ridge, and he reported there were some ups and downs but it was an aesthetic line. At waypoint NYBUT2 there was a large pole sticking up, a good marker if you haven't found the trail yet. We dropped our packs just as the trail levelled out and headed for the peak over rocks and fallen trees. There was somewhat of a competition to find the best route or to reach the top first, so people straggled in for some time. In retrospect, if you're doing the traverse, I think the best spot to head for the peak is from the boulders where the trail drops to the north (waypoint NYBUT4). Approaching the peak from the west avoids most of the obstacles, but the difference is minor. Our best summit block, New York Butte. 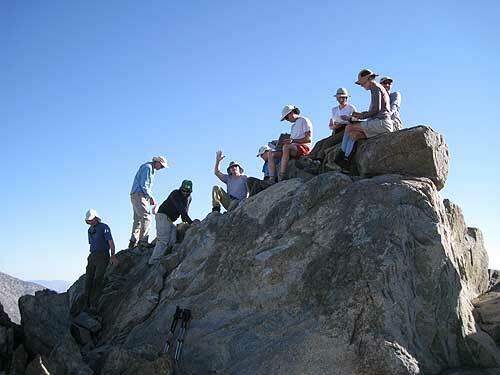 The summit block of New York Butte (waypoint NYORKB, 10668') is only large enough for half a dozen people. We took turns for half an hour starting at 8am. We took pictures into the morning sun. We enjoyed the register entry from the four-wheelers that mentioned the crazies walking up the road. That would be us. Hoisting packs, we dropped north to a saddle (waypoint NYBUT5) where the trail vanished and we ended up in brush again. Oops. The trail is definitely worth finding, and it's definitely along the whole ridge. While climbing toward Point 10192, we crossed onto the right (east) side of the ridge for the first time. The use trail here does not quite match the road on the map. The next saddle (waypoint GOATSP) was above Goat Springs, and as we climbed out of it we saw a couple of people heading up from the springs to the saddle. I guess there was water here, but we didn't go see. If so, the water was in a stand of brush near the spring symbol on the map. North of this saddle we once again were on the west side of the ridge, because the ridgeline itself was boulders. Someone found the register on Point 10414, and those who were nearby signed in. Who would have expected this minor bump to have a canister? But it does! We stayed on the ridgeline from here to Forgotten Pass (waypoint FORGOT), the start of the climb to Keynot. We stopped for route debate just south of Forgotten Pass. Someone spotted a faint use trail cutting through the trees, far from the ridge on the north side of the pass. I'm convinced we never walked on that trail, but we found another that worked pretty well. The one we ended up using could not be seen from even a few feet away, so be sharp or spend a lot of time slipping on talus! From the pass we basically traversed level through several draws until we entered a band of trees (waypoint KEYNO1). We climbed up in the trees and crossed one more draw before bumping into a well graded trail switchback (waypoint KEYNO2). We couldn't really see where this trail went further down, but it wasn't just a random use trail and it's NOT on the map. One person started throwing up here, probably from exhaustion, but Barbee nursed them back to health with sips of water and Ritz crackers. Maybe the glucose goo packs helped also. One or two other people got down to their last liter of water... and we had a whole day to go! I drew some switchbacks on the map, but I'm not sure how many there are. The group that had left me some water had a terrible time here, never finding anything they thought was a useful use trail - see their 2009 report. Take your GPS and find this one! The trail went up and north, switching again at KEYNO3. After a few more switchbacks, the good trail ENDED at waypoint KEYNO4, only about 100' below the cliff band but 400' below where we hit the ridge. From here to the ridge we had to pick out sections where you could, and there was some confusion at times about where the trail was. It's worth finding, however, as it goes due north until KEYNO5, then cuts east to the ridge (waypoint KEYNO6). We topped out on light rock in a flat notch with some nice trees. The notch is too small to show on the map. Magically there was a very attractive trail leading down the other side! Don't take that trail. We did, and it gradually leads you downhill and away from the ridge while you should be climbing directly on the ridge. Go over the false summit and drop a few feet to a saddle before climbing the last 300' to the summit of Keynot Peak (waypoint KEYNOP, 11101'). Going around the false summit also works, but it's not worth the effort. The front of the group got to the summit around 5pm. There were a few campsites near the summit, which is where the leaders had decided to stay after the front of the group had left a rest stop at the saddle. I thought we were going to descend for camping, but when people started claiming campsites I moved my pack back down from the peak to a nearby flat spot. Little did I know this would end up being the spot the leader wanted, and little did I know that the leader has the right to kick anyone out of any campsite. All this was explained to me by RonH, but all the flat spots were gone by the time I was booted... and since I wasn't willing to excavate a platform in the desert soil as others had done, I ended up over 100' below everyone else. At least it was quiet down there! Sunset over the Sierra Nevada, including a rain shower. There was one last patch of snowbank near the final saddle, salvation for our water-starved person who filled a water bag and slept with it. There had been rain on 3 sides of us (but none ON us) and I returned to the summit to make some phone calls as the sun set. More than one person had trouble with the altitude (sleeping over 11k isn't common on DPS trips, and this was the high point of the traverse). Fortunately the lightning we saw after dark was somewhere far away, since we were camped on the range high point! Walking down the north ridge of Keynot early in the day. Our last day was all about downhill. We started before 630am, following a use trail about 100' down on the northeast side of the ridge. After a while the use trail comes out on the ridge, and it's a nice gravel jaunt down to the saddle above Bedspring Camp (waypoint BEDSPS). No, we never saw a running spring. Yes, we did see an old bed with springs, but that came later. 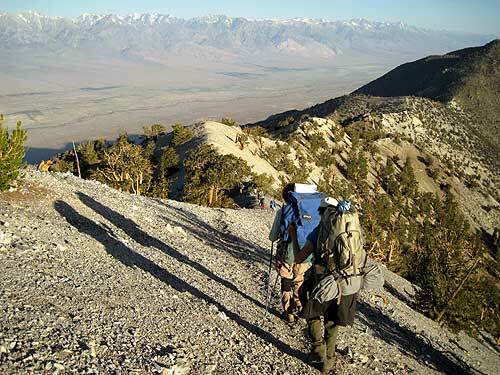 For now, we dropped our main packs and took water and snacks for the hike to Inyo Mtn. Daryn apparently had spare water with him, and had told me there was another 1.5 liters here - this cache he had carried, so it was even more special! I had enough, but this extra bottle allowed me to really fill up. We scrambled over a small bump, then north up the ridge to Inyo. The map makes the ridgeline look easy, but it's quite lumpy in real life and "there be dragons there" - no one on the trip knew of anyone who had tried doing the ridge. So we didn't either! At waypoint INYOM2 we went through a really nice meadow, staying well away from the ridgeline before turning due north to the final summit saddle. There is brush and boulders here, but it's not hard unless you want to do a little class 3 scrambling. 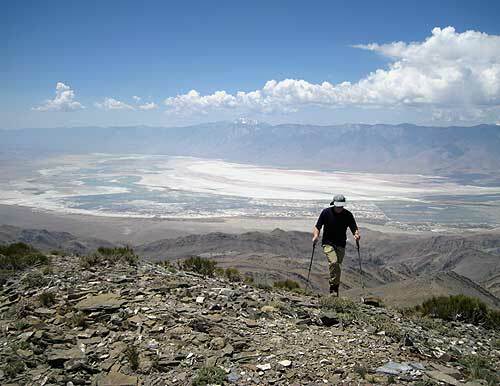 It took us about 1.5 hours to reach Bedspring Saddle (waypoint BEDSPS, 10000') and rest, and another 1.5 hours to reach the summit of Mt Inyo (waypoint INYOMT, 10975'). Surprisingly, it took longer to return to the saddle than to climb Inyo! Ron pointed out the chocolate-colored ridge to the left when looking down the gully from Bed Spring Saddle, making sure everyone knew to cross the ridge above the lowest hump visible from the saddle. There's a use trail that does this, but if you miss it you'll end up cliffed out! We went straight down the wash until a clear use trail appeared, following it near the bottom of the drainage. There is a bedspring at Bedspring Camp (waypoint BEDSPR, 9400'). I'm not sure why anyone would camp there: it's not that flat, there's no water, it's nowhere NEAR the place in Union Wash called Bed Spring, and the view isn't as good as elsewhere. But there it is, rusting away. A quarter mile down-canyon from the rusty bedspring, the use trail angles over to the ridge above Point 9155 (leaving the wash at waypoint BEDSP2 and crossing the ridge at waypoint BEDSP3). The REAL fun starts here! The trail tips steeply down on loose shale/talus. There are some switchbacks, but mostly it's steep and loose. At BEDSP4 the angle eases a bit and you have a nice walk on the ridge... for a while. At BEDSP5 the trail abruptly drops off the right (north) side of the ridge and gets even STEEPER. Before long you're plunge-stepping in hardball-size sharp rocks. A real boot shredder where you don't want to fall but can descend at over 9000 feet/hour. At BEDSP6 I crossed from one gully, where the rocks were getting pretty big, into another where I could glissade the rocks again. Needless to say, the group got pretty spread out here. 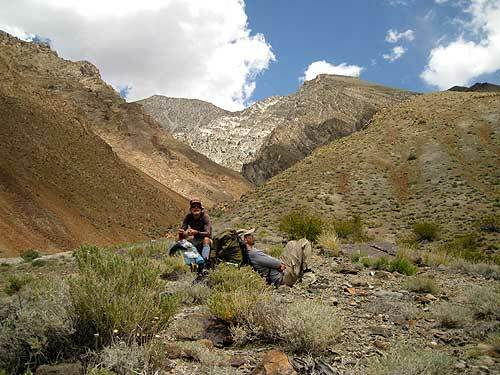 The Bedspring Camp trail came out into the gray gravel of Union Wash at waypoint UNWABS (5400' below the saddle, at 4600'). If you're going UP the wash, look for some mud banks on your right (south) and turn uphill right after them. I had managed to catch up with the leaders, but I should have hung back. Barbee (trail sweep) pointed out to some people that there was a cool dry waterfall about 100' up-canyon in Union Wash, and it turned out NOT to be dry! Those people got to wash up while the shuttle drivers dashed to the cars and the rest of us near the front hung out in the sun. We walked down Union Wash on riverbed rocks, spotting cactus flowers and wishing the storm clouds over the valley would block our sun also. As soon as some old mining equipment was visible on the north bank of the wash, we took the use trail up onto the south bank of the wash (waypoint UNION1, 5500'). This leads to the 4WD trailhead (waypoint UNWA4W), which in our case just meant easier walking down to the 2WD trailhead (waypoint UNWA2W) where the cars were. The head of the group got to the 4WD trailhead about 2pm, the back of the group got to the 2WD trailhead around 330pm. Waiting for the group at Union Wash. It took a long time for the group to regroup, but eventually we headed down to Lone Pine. The drivers retrieving cars from Cerro Gordo were a few minutes behind the rest of the group, but since they were generally faster they got a head start and it all worked out pretty well. A bit of washing and gear packing in the park, an hour at the pizza place, and we were all on our way home. OK, not all of us. I stayed another day to avoid Memorial Day traffic and climbed Nelson Range, but that's a separate report. As we drove away after dinner, it seemed clear that the storm was finally raining where we HAD been, but it never rained ON us. Thanks to the leaders/coleaders for an excellent adventure! Here's how the Inyo Mountains looked from the south as I drove away. I guess we got out just in time! STATS: According to the line I carefully drew in Topo after the trip, our first day (Cerro Gordo to Burgess Mine) was 11.4 miles with 3300' gain and 1900' loss. Our second day (Burgess Mine to Keyot Peak) was 7.1 miles with 3800' gain and 2400' loss. The last day was 7.1 miles with 1100 gain and 7500' loss. 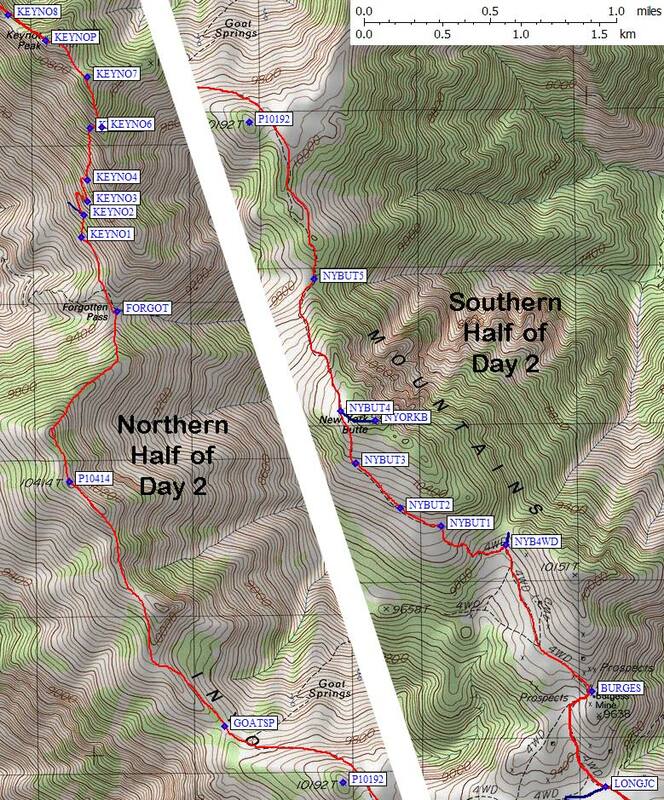 Remember that all the waypoints mentioned in this report are on the trailhead page. An interesting side note is that Verizon users will have cell service almost every step of the traverse.